Check out this Beautiful "Sophia Model" Villa in Premier Valencia Lakes which offers 3 Beds/2 Baths/2Car garage and much more! This home is COMPLETELY MOVE IN READY and meticulously cared for by the original owners. All the furnishings are being offered along with window treatments, ceiling fans and light fixtures making this an unsurpassed opportunity. Just bring your tooth brush and belongings and settle in! The kitchen boost beautiful Zodiaq countertops, tile backsplash, stainless steel GE appliances, a large pantry and an abundance of tasteful shaker style cabinets. Enjoy bar stool casual dining along with a formal dining area and a large living room perfect for entertaining, with all flooring featuring diagonal ceramic tile. Relax out back on the screened in lanai with extended pavers while enjoying your privacy! The owner's suite features a walk in closet and the bath has dual sinks, corian countertops and a walk-in glass door shower. New Maytag washer/dryer (2019), water heater (2017), owned water softener! 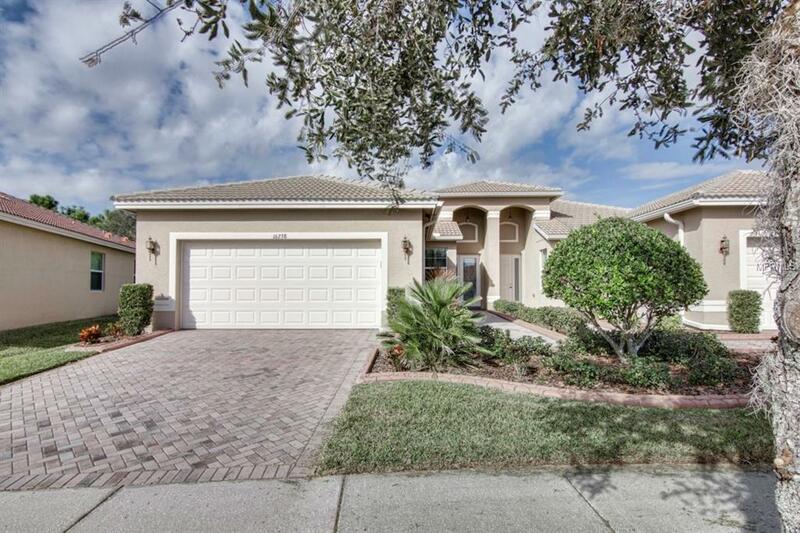 Located in the premier gated community of Valencia Lakes! Activities include outdoor recreation center, resistance, lap swim and resort style heated pools. Basketball courts, baseball park, RV/Boat parking, dog park, tennis courts and much more! The Clubhouse offers a large social hall, fitness, steam rooms, saunas, billiards, card room and internet caf. Centrally located between Tampa, Sarasota & St. Pete. Live like you are on vacation every day! Come see this one before it's too late! Additional Lease Restrictions Please See Hoa Docs.